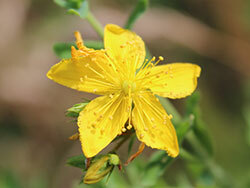 When people speak of herbal medicine, usually one of the first herbs that comes to mind is the St Johns wort plant. What most do not realize, however, is that St Johns grows wild in many temperate climate zones all over the world and is free for the taking 2-3 months a year. Once native to parts of Europe, it has naturalized to many other regions including Canada, Australia and the U.S. Most commonly identifiable for its cheerful yellow flowers, it is one of those herbs that has had a long history of herbal use, dating back to about 6th century AD. In the Middle Ages it was believed to be a magical plant species possessing the ability to ward off evil spirits and protect one against illness. It has most recently received widespread attention in the last 40-50 years as a herbal remedy for treating mild forms of depression. 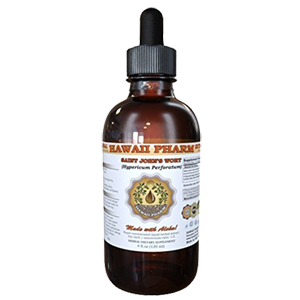 Extensively researched in the scientific community, several compounds in the plant have been specifically identified for their attributes as a natural antidepressant as well as anti-inflammatory, antiviral agent, and an anxiety and pain reliever. St Johns wort plant is one of those wild herbal medicinals that can be harvested in the summer months and dried for later use in teas or used fresh in tinctures, salves or oils. It can be enjoyed as a cup of fragrant stress reducing tea or as a more potent extract for uplifting the mood and sedating the nervous system. The most medicinal part of the plant are the blossoms, flower buds and to some degree the leaves, all of which can be dried or used fresh in tea infusions. Acting as a nervine and sedative for the nerves, some of the active ingredients responsible for these effects include phytochemical constituents like hyperforin and hypericin as well as pseudohypericin, adhyperforin and a variety of antioxidant flavonoids. Both hyperforin and hypericin increase extracellular levels of various neurotransmitters such as dopamine, serotonin, norepinephrine, all of which play a major role in cognitive processes and are beneficial as mood enhancers. Most all ancient healers and herbalists of Europe, Greece and Rome used the St Johns wort plant for nerve related issues and also to treat hysteria and nervous depression. 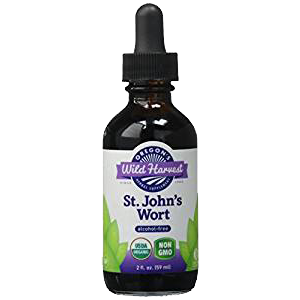 In addition, St Johns was a commonly used herb in salves applied directly to wounds, inflamed tissue and joints to accelerate healing and lessen pain in the affected region. 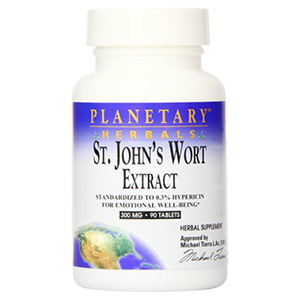 For the average healthy person, St Johns wort plant is not one of those herbs we would recommend taking on a regular basis in large quantities. 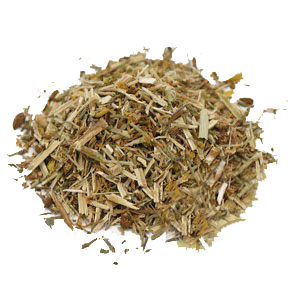 Similar to other herbs like dandelion root, milk thistle seed, pau d'arco, in addition to other liver or nervine herbs, it is best taken in small to moderate doses for short periods of time for therapeutic use. 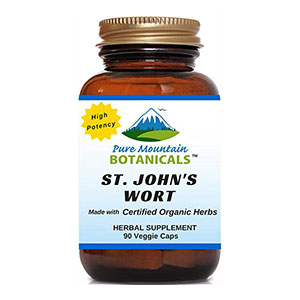 What is the St Johns Wort Plant? St Johns wort plant (Hypericum perforatum) is native to European countries but has spread to many parts of the world where appropriate climates persist for its survival. Here in California, St Johns can be found growing in many wild fields, meadows and close to streams or bodies of water, but also thrives in pastures and dry gravely soils. It is not to be confused with the common cultivated ornamental plant, Hypericum calycinum, which is the hybridized version with a significantly larger flower. 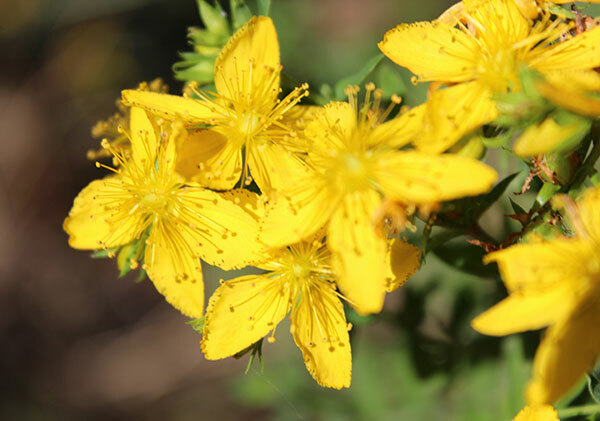 True St Johns wort plant has much smaller-sized flowers and typically grows wild in many temperate climate zones. The herb, with its bright yellow flowers, enjoys lots of sun and tends to peak around the summer solstice, the longest day of the year. It blooms early in summer and then dries out considerably later in the season, maintaining an average flowering period of between 2-3 months. 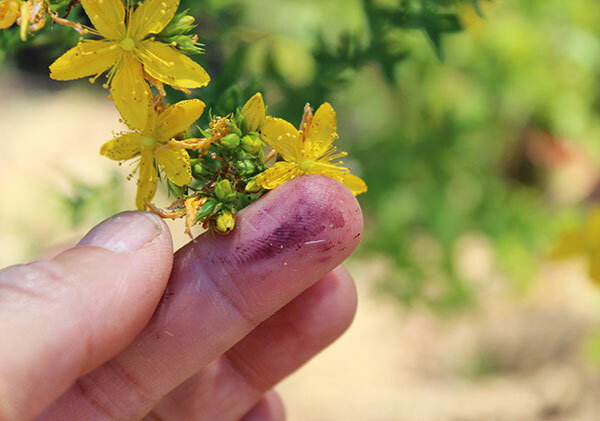 In ancient medieval herbalism, the St Johns wort plant was viewed in high regard and used extensively as a folk remedy for many conditions internally as well as topically for treating flesh wounds, joint injuries and burns. 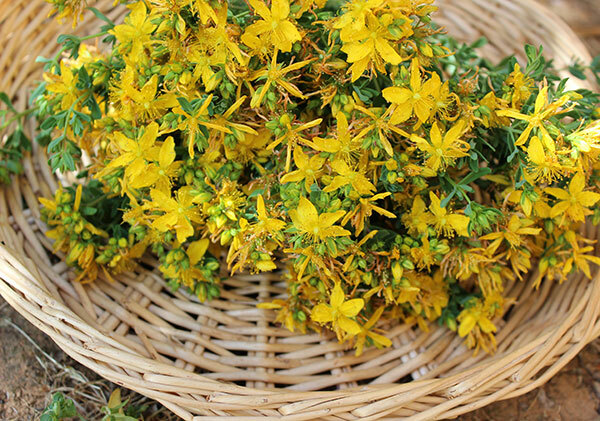 Believed to ward off evil spirits, the fresh herb was cut with long stems and tied together in four sections to create the ritualistic "St Johns wort cross." It was then hung above a main doorway for good luck and protection. Many herbalists throughout the world celebrate St Johns Day on June 24, considered the time of peak blooming, to honor St John the Baptist, the saint the herb was obviously named after. 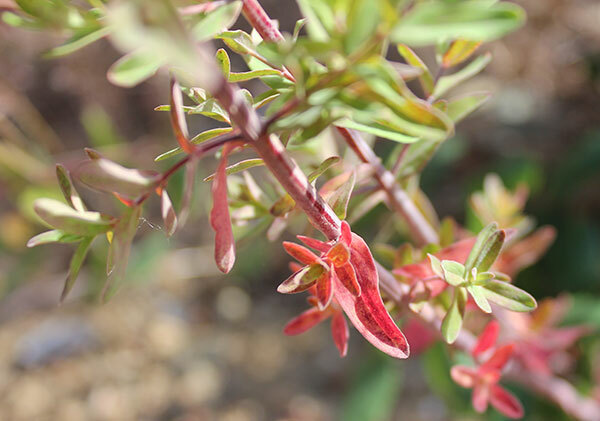 A red pigment in the plant was superstitiously believed by some in biblical times to be associated with St Johns beheading. 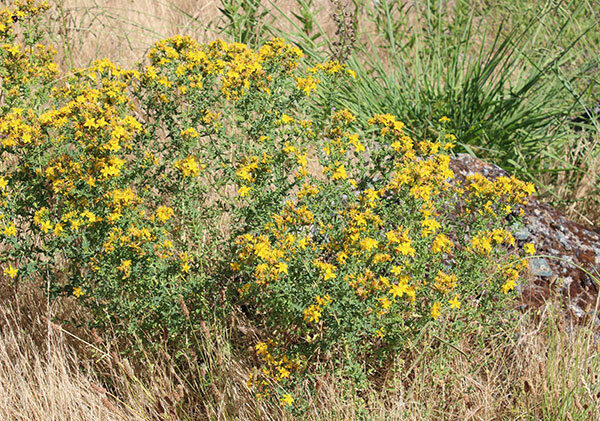 Although most herbalists enjoy and use wild St Johns wort plant when available, not everyone loves this sometimes invasive species which can be harmful and noxious to livestock animals who may potentially graze on large quantities of it in fields and pastures. This can create a condition that can cause photosensitivity and various health complications in horses, sheep, pigs and other domesticated animals. Most people have probably come across St. Johns growing naturally in wild regions, but don't really recognize it as such. St Johns is easily identified and once you become familiar with it, can be recognized from a fairly good distance. Growing at about 3ft (1m) in height, the small 5-petaled flowers grow in clusters at the top of the long tiny-leafed stems. The flowers have many stamens in the center with a single pistil in the middle. This is a characteristic that is also very evident and exaggerated in the ornamental variety. 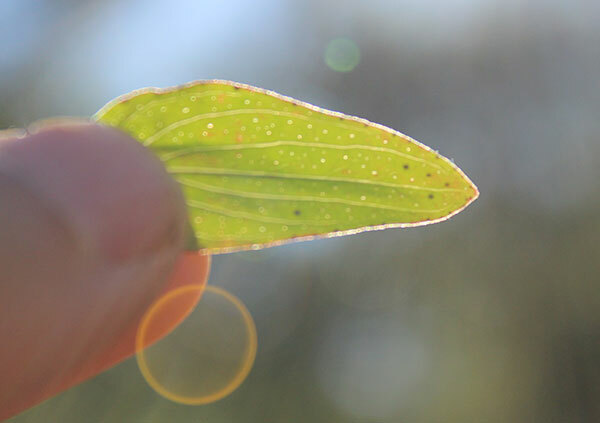 The small pointed leaves of St Johns wort plant when held up to the light have tiny transparent dots, which are oil glands, running throughout the leaf, giving them a perforated appearance, one of the reasons for its Latin name Hypericum "perforatum." This is one easy way to identify it to make sure you have the real plant species. Another characteristic of the herb that makes it easy to recognize is the red substance that appears when the flower buds are crushed. This produces a blood red carotenoid substance which is also sometimes obvious in the leaves and stems. When the fresh flowers are tinctured or solar infused in oil, the liquid turns a deep red color. The volatile oils in this compound also make it very fragrant. 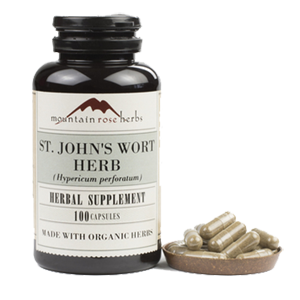 Over the last 50 years St Johns wort has undergone extensive research validating its benefits as a natural antidepressant. Depression is a condition that is becoming more and more prevalent in modern society, impacting over a 100 million people worldwide. Defined as a state of sadness, despair or despondency about one's life that often goes along with low energy levels and an aversion to physical activity, depression can dramatically affect an individual's capacity to live a happy existence and self-fulfilling life. Depressive disorders can vary from person to person but generally are either severe, with ongoing symptoms, or frequent, but short lived. There are many theories about what causes depression from an actual chemical imbalance, low brain production of serotonin, toxicity in the body, genetic vulnerability, side-effects of other medications, diet and lifestyle choices, sleep disorders, general life anxiety as well as the psychological impact of an unconsciously unfulfilled life purpose. While some pharmaceutical antidepressant drugs might be suitable for major depressive disorders, some people with mild to moderate depression have also shown to benefit from taking St Johns wort extracts. 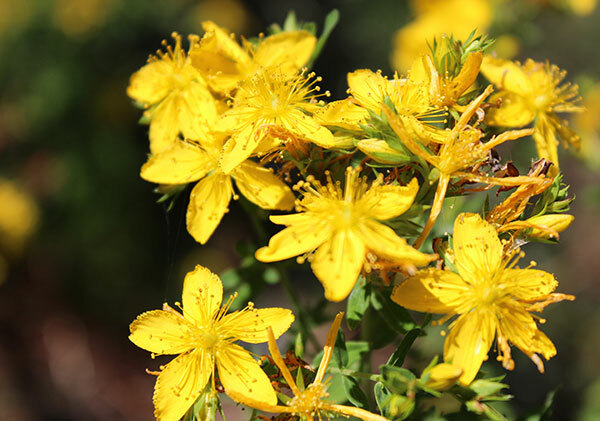 In a double-blind study comparing the extract of St Johns wort to the antidepressant sertraline is was concluded that, "The hypericum extract was at least as effective as sertraline in the treatment of mild to moderate depression in a small group of outpatients." Most antidepressant drugs target neurotransmitters, artificially increasing the brains "feel-good" chemical compounds like serotonin, dopamine and epinephrine, but this is only one aspect of this multifaceted condition. 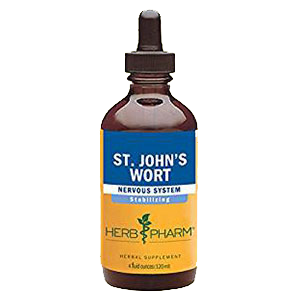 St Johns wort not only works to gently balance these neurotransmitter monoamines, but also helps to regulate many factors that may cause depressive states, like insomnia, inflammation in the brain and body, anxiety and nervous tension. While the herb and especially the standardized extracts may be of benefit to some people with mild to low-level depression, they should not be considered a panacea without addressing other underlying issues that may also be contributing to general feelings of despair and lack of zest for life. 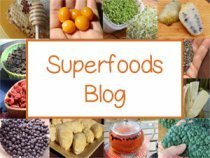 We also highly recommend daily aerobic exercise, nutritional supplementation (especially increasing omega-3 fatty acids, minerals and B vitamins) as well as partaking in stints of juice fasting or adhering to a cleansing raw vegan diet for a period of time. 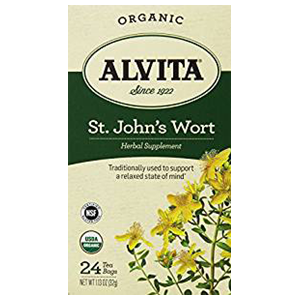 St Johns wort can be used as an adjunct and dietary supplement, along with this health enhancing protocol, but should not be taken in conjunction with other prescribed antidepressants. The herb is most commonly used as a standardized extract for depression as these formulas isolate the active ingredient hypericin. We always advise taking the natural whole herb, as a tea or liquid tincture, when using these standardized formulas for optimal uptake and efficiency. 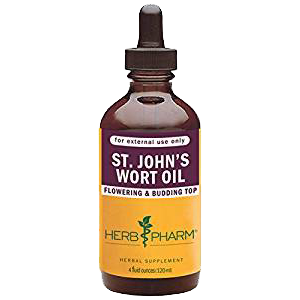 The St Johns wort plant is one of those medicinal herbs that can interact with other medications, so it is important to consult your physician in such situations before using it for therapeutic purposes. 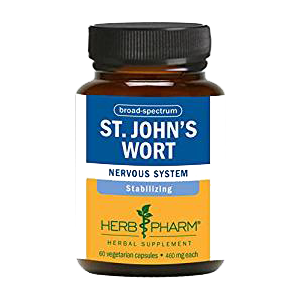 In traditional Western herbalism St Johns wort is considered a nervine, these are herbs that work to gently soothe and nourish the peripheral nerves and muscle tissue, naturally easing tension with a relaxing effect on the nervous system. 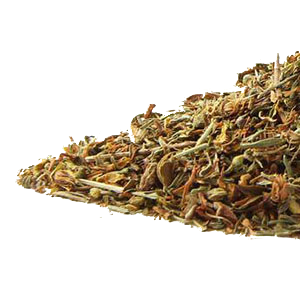 Hypericum is usually placed in the same category as other nervines like catnip, hops, passion flower, lemon balm, cramp bark, valerian, chamomile, California poppy and skullcap. Note: The St Johns wort plant is known to decrease estrogen levels, which may or not be of benefit depending on your unique situation. The herb is not therefore advised for women taking contraceptive pills and may affect female menopause in which estrogen is considered a beneficial hormone. 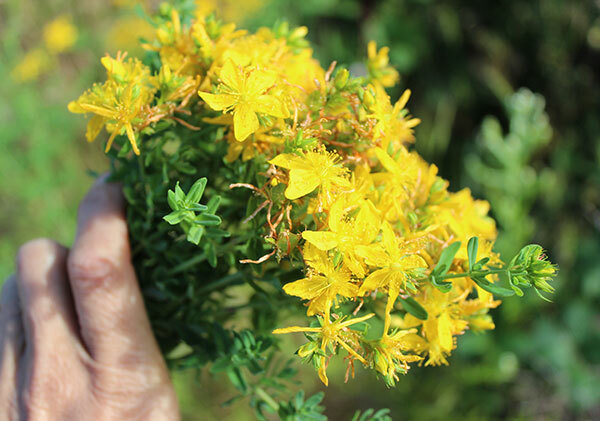 The well-studied mechanisms responsible for St Johns wort's therapeutic effects are two main substances hyperforin and hypericin, in addition to adhyperforin, pseudohypericin, tannins and various flavonoid antioxidants like quercetin, rutin and myricetin. Hypericin is the main focus of standardized formulations, which are usually comprised of 0.3% hypericin content. Despite numerous attempts to synthesize the hyperforin constituent, to date complete extraction is still not possible. This is where taking the whole herb and all of its secondary constituents and trace elements can be advantageous. 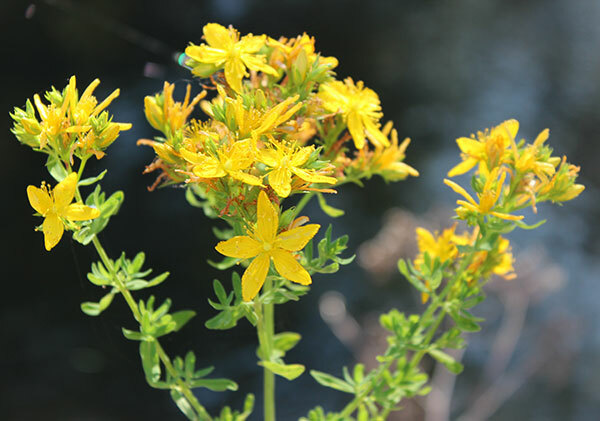 According to the 2011 publication, "Herbal Medicine, Biomolecular and Clinical Aspects: Medical Attributes of St. John’s Wort", hypericin works to stimulate capillary blood flow and has "shown to have a strong affinity for sigma receptors, which regulate dopamine levels." Hyperforin is a potent reuptake inhibitor of monoamines, precisely serotonin, dopamine, noradrenaline and less specifically GABA and glutamate. 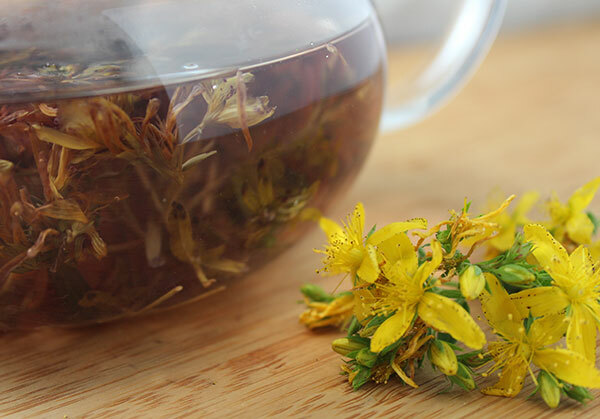 While St Johns wort extracts can be used as a natural antidepressant, you don't need to have depression to take and use this powerful herb as a tea or tincture. St Johns makes a very pleasant tasting tea and can help to calm and relax the nerves at the end of a busy day. 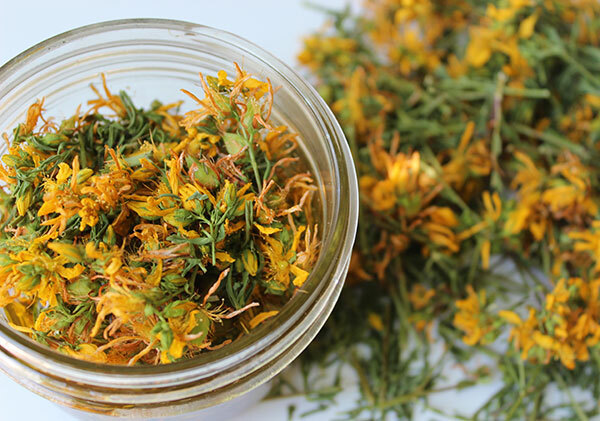 Depression and insomnia are closely linked and St Johns wort plant, especially when taken as a concentrated tincture or extract, can act as a potent sleep inducer for some people. 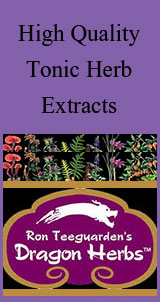 Its effects are often enhanced when used with other nervines that also encourage deep sleep states. There are many causes of sleep disorders, low serotonin and melatonin being one of them, but St Johns also helps to address other issues that may be affecting one’s ability to sleep restfully. Because not all herbal sleep inducers work the same way for everyone, it is a good idea to experiment with low doses before beginning a treatment protocol. 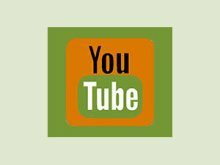 It may also be helpful to seek the advice of a holistic herbal practitioner for developing a particular formula specific to your unique sleep issues. 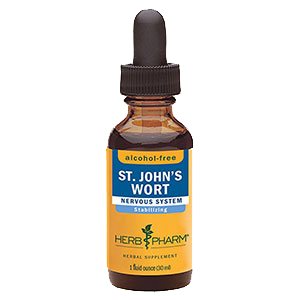 The hyperforin in St Johns wort is the main component responsible for the herb's profound effects as an anti-inflammatory agent. 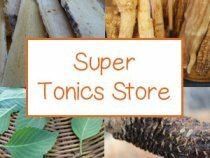 Used for centuries by herbalists around the globe, it has been utilized for both topical use on sprains and inflamed joints as well as an internal remedy. Hyperforin is known to provide anti-inflammatory actions by inhibiting proinflammatory enzymes like arachidonate 5-lipoxygenase and COX-1. It also functions as an analgesic, relieving pain from injury, swelling and traumas to muscle tissue or those involving nerve damage. 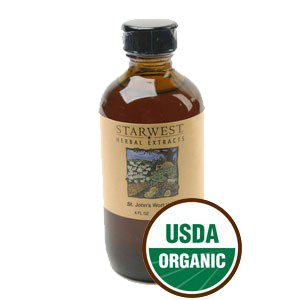 St Johns wort oil and tinctures are additionally antiseptic in nature. They are excellent items to have in an herbal first aid kit for all of these mentioned attributes. If you happen to live in a region conductive to its growth, fresh St Johns wort plant can be wildcrafted in the summer months. 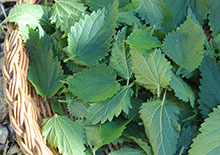 Traditionally in the Western U.S., it is harvested on June 24 (St. John's Day) as a ritual practiced by many herbalists. 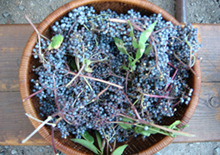 It also happens to be the time when it is commonly at its prime for picking. When looking for the highest quality specimens, the flowering tops should be newly opened and a vibrant yellow color. There is always some dried flowers on the tops along with the blossoms and closed buds. You can either clip off the flowering tops only or cut above the first 5 inches (12cm) of the plant if you also want to include some of the leaves and stem in your herbal preparations. We usually include all three for good measure. You can use the herb fresh to make oils, salves, teas or tinctures or you can dry and store it for later use in herbal teas. Your plants should be located away from any roadside or polluted location to avoid possible contamination. You can also gather the tops when seeding and use them to plant in a garden space. Generally if you plant the seeds in the fall they will come up the following spring. 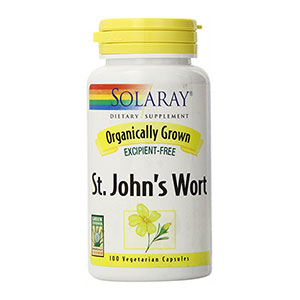 St. Johns wort adapts to most soil types, tolerating an acidic to slightly alkaline pH. 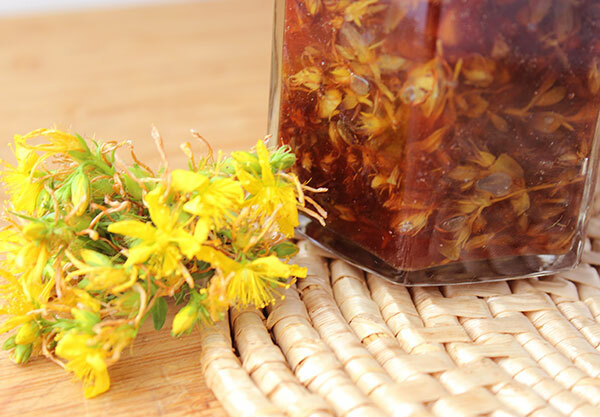 Making St John's wort oil is a common practice among wild food foragers and herbalists alike. It is traditionally made with olive oil although other oils, like coconut oil, can also be used. It is always prepared using freshly harvested flower tops that include mostly blossoms and buds with a small amount of leaves and stems, not more than 20%. To make the oil, pack whole or chopped up fresh plant material in a glass jar and fill it with organic (preferably) high quality olive oil. Screw on the lid and place in a sunlit window or outside in the sun for 2 weeks. This might sound counter intuitive at first because most oils will naturally go rancid when exposed to direct sunlight. However, the plant material infused in the oil acts as a preservative. This technique is called a solar infusion and is the customary way it has been made for many centuries. After a one to two week period, the oil will turn a bright red color, this is when you know it is ready for straining. The oil will also take on the fragrant scent of the essential oils found in the St Johns wort plant. Likewise, alcohol tinctures can be made using the freshly harvested flower tops by infusing them in alcohol for at least two weeks time, but in a dark dry cool location. 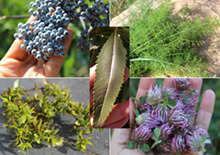 Fresh Plant - Freshly harvested herb, mostly blossoms and buds with some leaves and stems. Dried Plant - Dried whole flowering plant material. Standardized Extracts - Usually evaluated by the content of hypericin, standardized to at least 0.3% hypericin derivatives. that can range up to 0.28% which may contain pseudohypericin and partial synthesis of hyperforin. Essential Oil - This is the fragrant steam-distilled concentrated oil of the plant material. The typical dose recommended for standardized extracts (0.3% hypericin) is between 300mg-900mg a day. Because all extracts and tinctures may vary in concentration, it is a good idea to follow the prescribed amount advised on the product label. 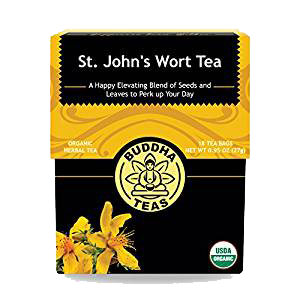 St Johns wort plant can be enjoyed as a nice cup of tea before bedtime or even throughout the day as a mild anxiety reliever and mood uplifter. When using the fresh flowers you will need to use more than you would the dried herb material as there is more water content in the fresh plant. One to two tablespoons of the dried herb can be infused in a cup of hot water and taken before bedtime as a natural sleep aid. For depression treatment, tinctures or standardized extracts may be more effective as they contain concentrated hypericin content. Some herbalists recommend staying out of the mid-day sun when undergoing St Johns therapy because of potential issues with photosensitivity which may increase risk of sun burn, especially for those with fair skin or light complexion. 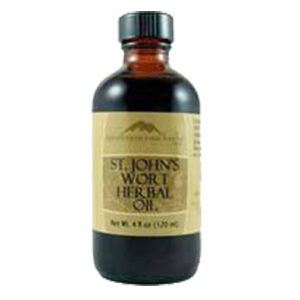 St Johns is an excellent herb to have in your household first aid kit in the form of a tincture or as a topical salve or oil for sprains or inflamed conditions. The flowers are actually edible and can be used to decorate salads and adorn desserts or meals. Some people also use the prepared oil for internal use tossed lightly over greens. Be careful not to use too much, however, as it can be very sedating to the nervous system. Do not combine St John's wort with prescription antidepressants, especially SSRIs, which may lead to a potentially life-threatening increase of serotonin. 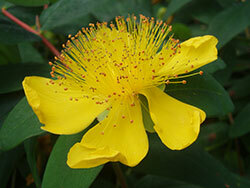 Consumption of St Johns wort is discouraged for those with bipolar disorder. Do not use concentrated extracts while taking prescription drugs without the advice of your medical physician. Avoid excessive exposure to UV radiation (ie: sun bathing or tanning salons) when using therapeutic doses of St Johns wort plant. It is not recommended for use by pregnant or breast feeding women. St Johns wort also decreases estrogens, like estradiol, by speeding up its metabolism, and should not be used by women taking contraceptive pills.